Virtual Reality is upon us, by friends. This year at EGX, I had the opportunity to try the Playstation VR (formerly Project Morpheus) and was blown away by the experience. I mean, wow. Playstation VR is slated for a 2016 release, as is the HTC Vive and the Oculus Rift. We will have plenty of choices for how to immersive ourselves mentally into new worlds. But what about immersing ourselves physically? Back when Oculus first put VR in our minds as a tangible, reachable dream, a few people dreamed even further. 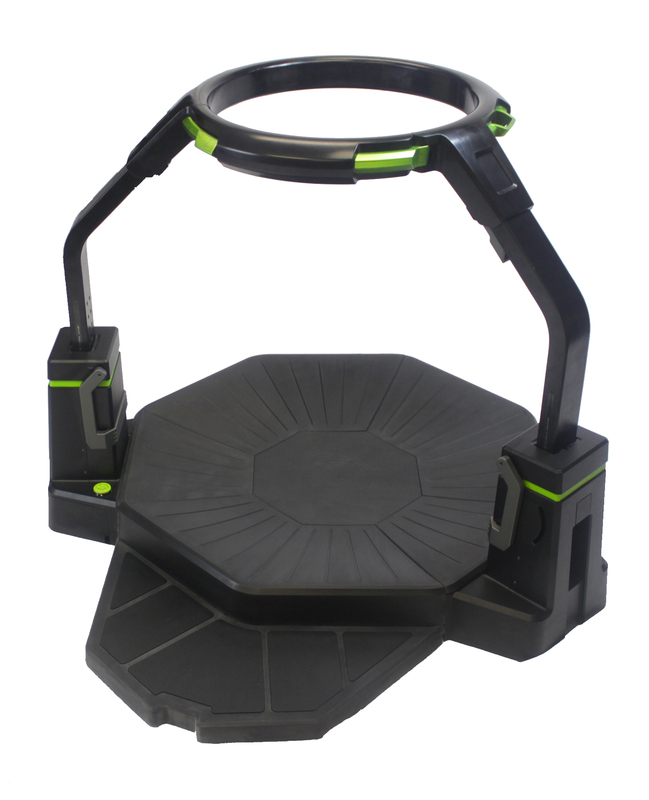 We were introduced to the omnidirectional treadmill controller, a platform in which you could walk, run, crouch and jump your way through gaming. Paired with a VR headset and motion controllers, you would be transported into your favourite game, mind and body. 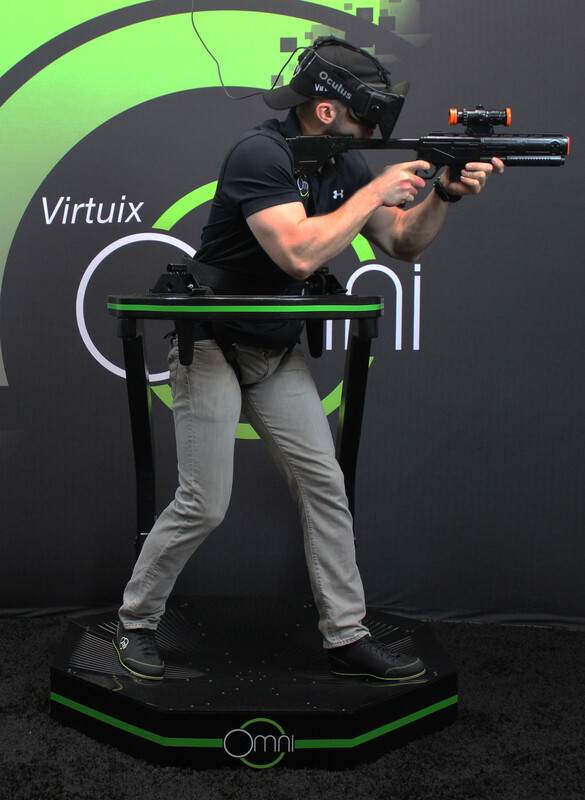 Two companies have come out of the woodwork with consumer-grade solutions: Virtualizer by Cyberith and Omni by Virtuix. Both ventures saw successful Kickstarter campaigns and are presently available available for pre-order with late 2015 / early 2016 releases. The idea behind an omni treadmill peripheral is that your motion is the controller. As you walk on the surface, your character walks. As you turn, they turn. The immersion this gives you is phenomenal. Pushing an analog stick to make your Dovahkiin run sure is tiring – but imagine how tiring it would be if YOU were the one running, slinging spells, sneaking and stealing sweet rolls, and jump off High Hrothgar to your doom? I can’t think of a more ideal way to get fit than shouting dragons out of the sky (or running from bears)! While they are both omni-treadmills, they have gone different ways with their execution. There are advantages and disadvantages to each, certainly. While the fact Omni is in the United States and Virtualizer is based in Europe may affect the decision slightly (Omni does international shipping, whereas Virtualizer has separate US and EU stores), the biggest factor here is going to be price. And there is, unfortunately, a doozy of a difference to push things in favour of one side. 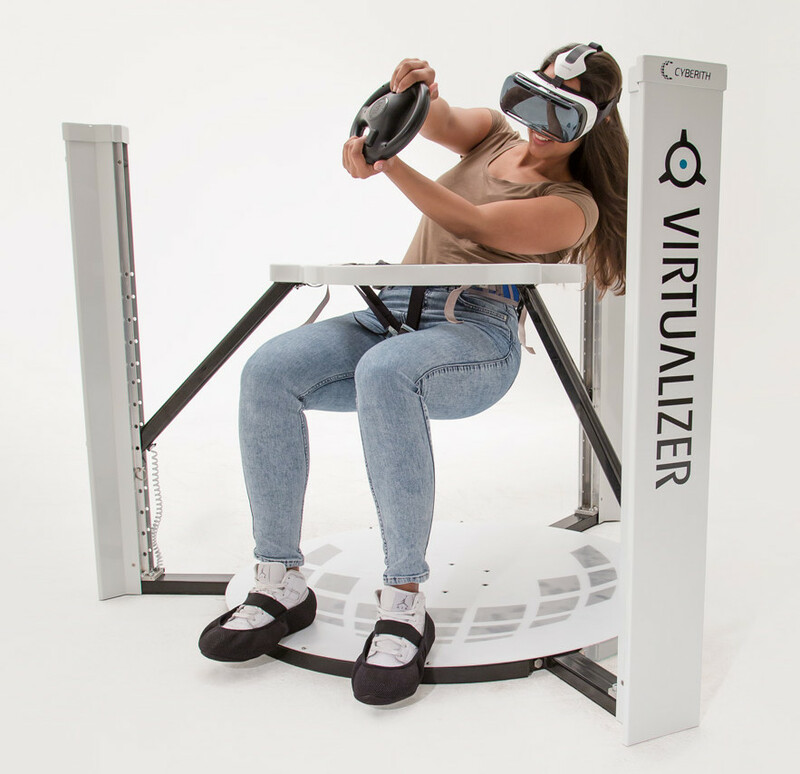 During the Kickstarter campaign, the consumer-package of the Virtualizer was available first at $699 for earlybirds and then $749. The Omni was similar, when all accesories are considered – the platform setup was $349 for the earlybirds and $399-$429 thereafter. Factor in that the Omni may require additional shoes and sensors where the Virtualizer doesn’t, the price starts to creep up. The Virtualizer’s ring support moves up and down with the user on sliding poles as they move, whereas the Omni’s ring support is at a fixed height. Both companies see their decisions as a positive, so it may just come down to user preference. Now, both peripherals are on pre-order. The Omni has come in for a full package (platform, harness, set of Omni shoes, and foot sensors) at $699. This is a 63% price increase from Kickstarter, at a $270 difference. This isn’t too bad. 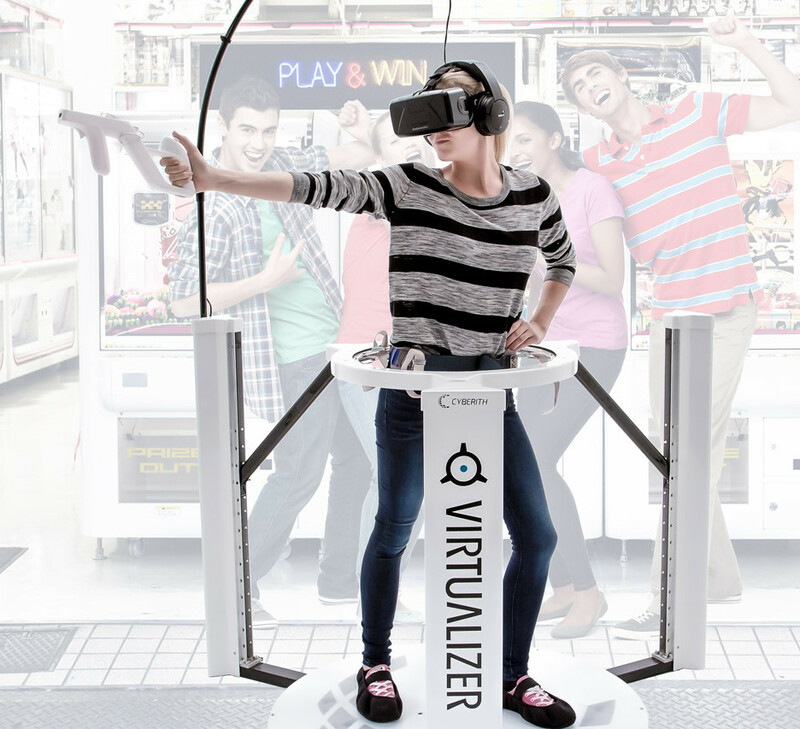 The Virtualizer, on the other hand, pre-orders at $1,249. While that is a 66.6% increase, not far off of Omni’s, that increase totals an extra $500 and pushes it past the $1,000 point. Ouch! And if you’re in Europe, you’re boned further – the EU store is selling them for €1,499 on pre-order. Roughly converted via Google, that’s $1,674, an extra $425 from the US store. This is also the standard package. The HT package, which features haptic feedback in the plate like a rumble pack comes in at $1,499 – during the Kickstarter, this was offered for $999. While a 50% increase isn’t as bad as the main package, it’s still another $500. None of these prices is factoring in the shipping costs. The Omni can ship from $90-$150 within the US, and anywhere from $125 to a whopping $500 internationally depending on the country. The Virtualizer’s shipping isn’t much better – the US store puts shipping at roughly $200, where the EU store ships for €100 (roughly $113) when checked against UK, France and Austria. We’ll put this in perspective for my situation. If I wanted the Omni for just myself, I’d be looking at a full pre-order package at $699. For shipping to the UK, it lists $100-200, so we’ll err on the side of caution and for with $200. But, I am not the only user in my house – my husband plays games as well. So we need another pair of shoes and sensors. We could probably use the same harness. So, another pair of shoes and sensors puts us to $59 and $79 respectively. In total, we’ll looking at $1,037 for a two-person Omni setup. (If we needed another harness, that’s another $79.) Translated for pounds sterling, I’d be set back £675. If I wanted the Virtualizer, I’d go through the EU store. A full pre-order package would be €1,499. If we wanted to buy the Arm, an attachment for keeping the VR Headset’s cabling out of the way, that’s an additional €89. If we want to wear shoes on the Virtualizer, we’ll need some overshoes, coming in at another €35. The overshoes come in two sizes, each covering a range of shoe sizes, and Hubby and I fall into the same size so we only need one pair. We can also use the same harness here, so another one isn’t necessary. Shipping to the UK is €100. That brings us to €1,723, or $1,946. In the UK, this is roughly £1,267. I’ll be honest – I have always been looking at the Virtualizer over the Omni. The silent rig, the moving harness ring, and the ability to disassemble and stow have all been big on my list for a functional, practical solution. The Omni is just too large and bulky for me, and without the ability to break it down like the Virtualizer, that bulkiness would find itself as a permanent fixture of my living room. The fixed ring support, which they tout as a safety feature in case you slip, looks like something arms will constantly crash into with my demure height of 5’4”. For the tall, they’ll clear that ring easily, but for those that are average height and lower, it looks like a bruise-inducer. And I don’t know whether the noise would be an issue or not. Virtuix says it’s no louder than a regular treadmill and doesn’t disturb anyone, but that’s their word. I can remember treadmills being pretty loud in my youth. And let’s not forget the extra accessories. Needing special shoes, in strict shoe sizes, and the “tracking pods” (sensors) for everyone is annoying, to be frank. And the fact that everything would be shipped internationally means you’d wait weeks for new kit when ordered. You’re now also in the territory of being at the mercy of their shoe sizing, where if the shoes don’t fit well, you’re screwed because they’re all you can use. I don’t have good luck with normal shoes – I don’t foresee these special bespoke ones being any different. Looking at the original Kickstarter price for the Virtualizer, I had anticipated a couple extra hundred added on for the final product, and was ready to reconcile this. After all, a really good treadmill would put me back quite a bit and this would be so much better! But I can’t justify £1,250. I just can’t. This is more than my entire gaming PC had cost. And let’s not forget that I’d still need to buy an Oculus Rift or HTC Vive on top of it. The Omni’s price point is a lot more alluring – but its bulky frame, need for extra accessories per user, and the fixed support ring (I’m short, damn it!) are all big turn-offs for me. And so, we have a dilemma. We have one product which is lighter, quieter, stowable and more adaptive to differing shapes and sizes, but costs an arm-and-a-leg. We have another that is affordable and functions similarly, but is bulkier, has a fixed-position support ring, requires special peripherals per person and will be a fixed decoration in your room, which is just not practical for everyday living and expense. Perhaps with time they will be able to adapt to more functional and affordable solutions, something that the average user will not only be able to keep practically in their home, but also be able to purchase without a loan. At the moment though, it appears that only the diehards and enthusiasts will be able to have first stab, while the rest of us patiently wait for something we don’t have to build a house extension to contain or donate plasma to afford.